“Tavernonna will honor the simplicity, versatility and quality of Italian cooking, while bringing an array of unique dishes and flavor profiles,” said Vamsi Bonthala, co-founder and CEO of Arbor Lodging Partners. 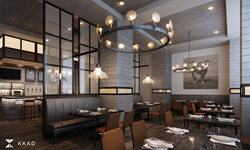 Arbor Lodging Partners, owner of the historic Hotel Phillips, announced a partnership with Chicago-based DMK Restaurants this summer, to develop a brand new restaurant concept in Kansas City. Today, Arbor Lodging Partners and Hotels Phillips (hotelphillips.com) reveal exciting new details about the concept, innovative menu items for hotel and restaurant guests to indulge in, and the name: Tavernonna Italian Kitchen. Tavernonna aims to celebrate the rich, varied history of Italian food, wine and cocktails, by using fresh, simple ingredients to create both traditional and contemporary dishes that entice the senses. Five-time James Beard-nominated Chef, Michael Kornick of DMK Restaurants has sourced ingredients from local farms and vendors to be celebrated throughout the menu, giving the restaurant a clear sense of its locality while honoring the distinctive ingredients rooted in Italy. Tavernonna will release additional details such as an opening date, venue décor and finalized food, cocktail and wine menus in the coming months. 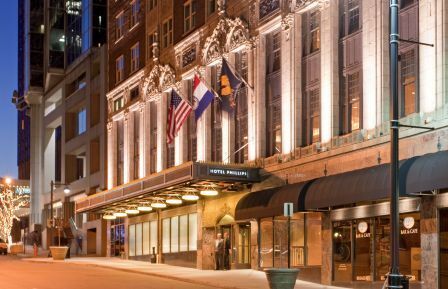 Voted the city’s best boutique hotel by KC Magazine for two years in a row, Hotel Phillips is located in the heart of downtown and within minutes of the city’s arts and entertainment districts, For more information or to make a reservation, visit http://www.hotelphillips.com or call (877) 704-5341 or (816) 221-7000. Hotel Phillips is Kansas City’s most historic and prestigious boutique hotel located in the heart of downtown. The hotel opened its doors in 1931 and today remains committed to unparalleled guest services and amenities to complement the hotel’s distinctive Great Gatsby art deco style. Featuring a beautiful and elegant lobby, spacious guest rooms and an award-winning restaurant, Hotel Phillips is listed on the National Register of Historic Places and has been recognized in Southern Living, USA Today, Food & Wine and The Wall Street Journal. Visit http://www.hotelphillips.com or follow the Hotel Phillips on Facebook and Twitter. Arbor Lodging Partners is a Chicago-based national owner and operator of hotels. The company was founded in 2005 with the goal of uniting the best practices of enterprising hotel operators and sophisticated institutional investors to effectively underwrite and execute investments in the lodging space. Arbor Lodging Partners makes investments in hotels, acquires loans secured by hotels, and, through its affiliate NVN Hotels, and manages operations for its own hotels and those owned by third-parties. A leading hotel management company with a range of services, NVN Hotels has been designated one of the nation’s top hotel companies in 2015 by Hotel Management Magazine. To learn more about Arbor Lodging Partners visit http://www.arborlodging.com. To learn more about NVN Hotels, visit http://www.nvnhotels.com. David Morton and Michael Kornick established DMK Restaurants, based in Chicago, with a mission to redefine casual dining through their shared passion for quality, method, design, and hospitality — all at an unparalleled value. In 2009, Morton and Kornick opened their first DMK Burger Bar (now with locations in Lakeview, Soldier Field, Lombard, and Navy Pier), followed by Fish Bar in March 2011, Ada Street in March 2012, County Barbeque in July 2013, Henry’s in June 2014, and Rec Room in July 2015. Visit http://www.dmkrestaurants.com for more information.